Being a rich source of vitamins, minerals, and nutrients, avocados are among the healthiest fruits on the planet. A single 40 gram serving of avocado offers 6 grams of fat, 64 calories, 3 grams of fiber and less than 1 gram of sugar. “Avocados are a fruit and one of the few fruits that are high in fat and low in sugar. Along with nuts, olive oil, and canola oil, the fat content in avocados are predominantly monounsaturated fat, which is responsible for many health benefits. Avocados are abundant in vitamin K, so they improve bone health and prevent osteoporosis, while the high folate content prevents the development of cervical, pancreatic, colon and stomach cancer, and lowers the risk of neural tube defects and miscarriage. Avocados are also high in a natural plant sterol, called beta-sitosterol, which lowers cholesterol levels and supports heart health. They also contain lutein and zeaxanthin, two powerful phytochemicals, which improve eye health and lower the risk of age-related macular degeneration. These healthy fruits help digestion, detoxify the body, regulate mood and sleep, help weight loss, and prevent chronic diseases, like diabetes, obesity, stroke, hypertension, certain gastrointestinal diseases, and coronary heart disease. Due to the incredible nutritional value and delicious taste, the price of avocados is constantly on the rise. -- Clean an avocado seed, and poke holes in it, using four toothpicks, placed on an equal distance apart from each other. -- Then, soak the seed in an inch of water, in a glass put in a warm place in the home, exposed it to sunlight. -- Within 2-8 weeks, you will notice a stem growing, and as soon as it reaches 6 inches, cut it to 3 inches. Wait for it to grow to 6 inches again, and leaves will start to appear. -- Make a hole of a few inches in a large pot with nutrient-rich soil, and plant the seed, but make sure half of it is out of the soil. The pot should have drainage holes on the bottom. -- Place the pot in a hot and sunny area, and water it like any other trees. If the leaves turn yellowish, don’t water it for a few days, and if they turn brown, the tree needs more water. In this case, put it in a sink, and let water run through it for a couple of seconds. 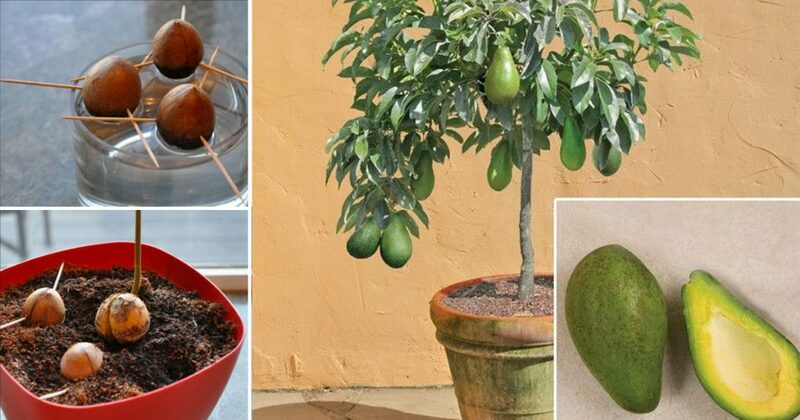 -- The tree might need a couple of years to bear fruits, but when it does, you will own the healthiest, natural, all-organic avocados always at hand!